Waiting On a Train in Minnesota. ST. PAUL, MN-The two-day retreat for the NARP board of directors has just concluded, leaving me in a kind of never-never land. I checked out of my hotel room at noon today, but I’m not actually leaving until 10:00 tonight when the westbound Empire Builder pulls into the St. Paul station. Several of us will be on the train tonight, so we’ll hang around the hotel, then cross the street to the newly renovated railroad station. Given the Trump budget that would cut all funds for Amtrak’s long-distance trains, unlike previous meetings, the prevailing mood was almost somber this time. Of course there is concern about the Trump proposal, but several of us were reminded when coming into town from the Minneapolis airport two days ago that this is where one span of a major bridge collapsed into the Mississippi River ten years ago. More than a dozen people were killed and 145 were injured. A bridge transporting thousands of computers on a major interstate highway simply falls down? How is that possible? I’m sure there was a detailed investigation and all the reasons for the disaster have been documented. But they’re all structural issues. The real cause was indifference and neglect. The fact is, there are more than 60,000 bridges in this country that are potentially dangerous. Fixing all this stuff would cost a helluve lot of money and that would mean raising taxes and, no matter how pressing the need, most politicians would rather lose a bridge than a re-election. Previous A New Look for NARP. NextOn the Empire Builder to Seattle. 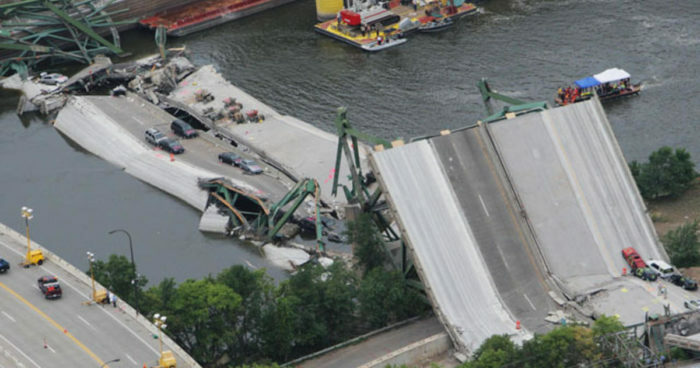 As a lifelong Minnesotan, that bridge collapse was something else to say the least. I can’t wait to hear about your ride on the Empire Builder as I’m planning to take it from Seattle to Minneapolis at the end of August!